Definition at line 111 of file llgroupmgr.h. Definition at line 120 of file llgroupmgr.cpp. 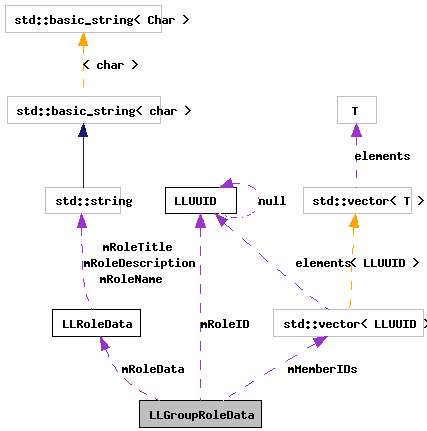 References LLRoleData::mChangeType, mRoleData, LLRoleData::mRoleDescription, LLRoleData::mRoleName, LLRoleData::mRolePowers, LLRoleData::mRoleTitle, and RC_UPDATE_NONE. Definition at line 137 of file llgroupmgr.cpp. Definition at line 148 of file llgroupmgr.cpp. Definition at line 150 of file llgroupmgr.h. Definition at line 184 of file llgroupmgr.cpp. References mMemberIDs, mMembersNeedsSort, and TRUE. Definition at line 204 of file llgroupmgr.cpp. References FALSE, mMemberIDs, and mMembersNeedsSort. Definition at line 129 of file llgroupmgr.h. Definition at line 142 of file llgroupmgr.h. Definition at line 145 of file llgroupmgr.h. Definition at line 152 of file llgroupmgr.cpp. References FALSE, LLUUID::isNull(), llmin(), mMemberIDs, mMembersNeedsSort, mRoleID, and S32. Definition at line 135 of file llgroupmgr.h. Definition at line 131 of file llgroupmgr.h. Definition at line 133 of file llgroupmgr.h. Definition at line 190 of file llgroupmgr.cpp. Definition at line 136 of file llgroupmgr.h. Definition at line 113 of file llgroupmgr.h. Definition at line 157 of file llgroupmgr.h. Definition at line 156 of file llgroupmgr.h. Referenced by addMember(), clearMembers(), getMembersBegin(), getMembersEnd(), getMembersInRole(), getRoleMembers(), getTotalMembersInRole(), and removeMember(). Definition at line 160 of file llgroupmgr.h. Referenced by addMember(), clearMembers(), getMembersInRole(), and removeMember(). Definition at line 154 of file llgroupmgr.h. Referenced by getRoleData(), LLGroupRoleData(), and setRoleData(). Definition at line 153 of file llgroupmgr.h. Referenced by getID(), and getMembersInRole().